A quick trip to the shops could be your next source of inspiration. See what all the fuss is about with these glorious window displays. You may be surprised how much a walk around your local high street or shopping mall could inspire you for your next project or design portfolio entry. With a good design eye, clothes, shoes, CDs, games, paper and even food can be combined to create a stunning window display. Originally set up to entice shoppers through the door, the art of window display has come a long way in the past few years. We've searched the world's shopping streets to bring you the very best examples of window display design from the very best creative directors, graphic designers and artists across the world. Enjoy! The window displays in Paris' Galeries Lafayette for 2018 were inspired by the designs of children between 5-11, who entered a competition. The best drawings were then transformed into the cuddly characters that adorn the displays. Luxury department store Bergdorf Goodman has a selection of intricately designed windows, which celebrate all things sweet. Each window of the New York store has a different colour scheme and you could easily while away some time spotting the details in each design. We particularly like the gingerbread theme of this display. Every year, Tiffany's flagship shop in New York gets a magical Christmas makeover. Past window displays have featured frosted cityscapes and opulent interiors, and last year's design were equally delightful. 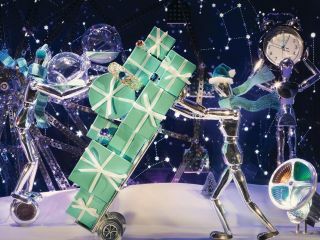 The 2017 window displays were a vision in Tiffany Blue and silver, and featured blinged-up artists' models whittling down diamonds, fishing for gems, or pushing stacks of jewellery boxes through the snow. Forget subtlety – for its 2017 Christmas window display, Harvey Nichols went for all out disco glam. The scheme is based around stars, neon lights and plenty of glitter (each of the mannequins has a face-full of the stuff). To create this traffic-stopping extravaganza, the store in Knightsbridge, London, used 5,370m (17,618 ft) of LED strip lights, 5101 baubles, neon balls and stars, over 2,000m (6562 ft) of sparkly vinyl, 3555 vinyl stars, and 382 rotating mirror balls. Phew. LaGalleria is a boutique in the heart of Yerevan, Armenia, and to publicise its Spring-Summer 2017 collection, retail marketing specialist Davit Muradyan created a set of stunning jungle-themed window displays. Showcasing hot new arrivals from luxury brands including Fendi, Valentino and Saint Laurent Paris, Muradyan artfully arranged the display so that the season's hot gear would stand out against a dense background of foliage. Designing, producing and installing the full set of 23 windows at Harrods might seem like a tall order, but that's what Elemental pulled off for the launch of Ermenegildo Zegna's Couture Collection by Stefano Pilati. Using an epic film created by Pilati for its Milan catwalk show as reference, Elemental's designs incorporated optical illusions, soundscapes, animated lighting effects and some incredible technology, including an enlarged view of a Zegna shoe that passers-by could manipulate through their own body movements, via infrared sensors. Designer brand Kate Spade teamed up with online auction site eBay to offer a unique shopping experience – bringing a whole new meaning to the phrase 'window shopping'. The striking yellow window display, located in Manhattan, not only showcased the items on offer beautifully, the interactive display also allowed consumers to shop the store window from their smartphones. This isn't the first time the quintessentially British department store will appear on this list, and for good reason. For Christmas 2015, Selfridges got the edge on the competition by bringing in SFX company Artem to create a stunning mechanical model of the solar system, which formed the centrepiece of a cosmos-themed window display. The 2.8m gold and chrome model rotated all day, every day until the New Year, with each of the planets orbiting independently. Read more in our news post from the time here. Ice sculptures transformed this window display of New York department store Barney's – Okamoto's own 'studio away from studio'. The world-renowned ice carving collective got to work carving intricate ice sculptures as shoppers watched on in awe, right next to the Ice Castles installation – a large-scale, immersive ice formation set inside the Madison Avenue window, which was transformed into a freezer just for the festive season. Illustrator Kristjana S Williams began working with luxury London department store Fortnum and Mason on its Christmas packaging, before being commissioned to apply her richly imaginative style to the shop's windows, too. The 3D designs featured no fewer than 300 owls, roosters and macaws adorned with gems, headdresses and crowns. Another entry from Tiffany & Co is this opulent display in celebration of the release of Baz Luhrmann's The Great Gatsby in 2013. The displays were designed in collaboration with the film's costume and production designer Catherine Martin, who has scooped Academy Awards for her work. Champagne glasses, hazy lighting, glass bubbles and plenty of jewels create a sumptuous 1920s vision – as well as showcasing jewellery pieces designed exclusively for the movie. See more of these gorgeous displays on Tiffany & Co's Facebook page, or take a look at the original sketches here. "It takes 60 hands to make one bottle of the world's finest ultra premium tequila," reads the tagline on this inspiring window display design. Designed by Harlequin, the Patrón Selfridges window focused on the 60 individual hands that make one bottle of Tequila Patrón. The concept for the window was inspired by Artist Bruce Nauman’s show in 1996 entitled 15 pairs of Hands. Zim & Zou are one of the forerunners in the medium of paper art, producing incredible masterpieces based on animals, foods, clothing and more. The duo showed off their skills with an incredible window display design for French boutique Hermes. Only using paper and leather, they created a stunningly intricate fox den filled with trinkets, crockery and clothes. Read more in our news post about the project. After working with the likes of Wallpaper*, Gucci, Casio, and Wired, designer Kyle Bean has turned his hand to window displays. This scene was created for Diesel's flagship store in London and features miniature models, vines and an impressive temple. To launch its Spring 2017 collection, Christian Louboutin wanted a space age theme, and StudioXAG obliged. Christian Louboutin boutiques across the world were adorned with glittering moon rock, jewel-toned cabochon lights, star-filled backdrops and glamorous astronauts. In the window of the Paris flagship store, a UFO pod was blown up to fill the entire window, with the new collection hovering between chrome panels. Bright Young Things is a pioneering project by Selfridges that seeks out and champions the most exciting young creators in the UK. Whether it's fashion, graphic design, illustration or food, Selfridges gives young adults the chance to show off their skills on a yearly basis. This year, artist and popmaker Becky Sloan created this cute, character-based window display for one of Selfridges' stores in London. With one million people walking past the famous windows every week, the displays provide an incredible launchpad for these fledgling designers to showcase their creations to the public. To promote TNT's crime-solving show Perception, design firm Breakfast revived a sign-making technique of yesteryear to create an anagram-solving experience on the streets of New York. Made up of over 40,000 physical dots spinning from black to white at 15 times faster than originally designed to, the screen reflects back the image of anyone walking by. This is a window display unlike any other.